Yes, I have repeated it again. This type of rescue attempt of the crown is still a compromise! May not have a post to secure the foundation. May have cracks within it. It is made of materials that are defective or not strong enough to hold the crown. The post is too short for the height of the crown. A record of the crown on the tooth needs to be made so a temporary crown can be made if need be. This is made with a putty material to record the crown in 3D and can be put aside indefinitely. A rebuild of the foundation needs to be done. 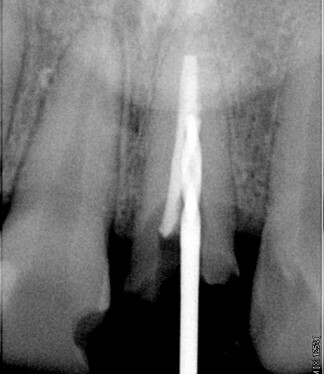 But first the crown must still be checked that it fits on the remaining tooth/root structure. If this is still good then old foundation and post and/or pins needs to be removed carefully form the crown. DO NOT TRY THIS AT HOME. Once removed pins or posts are placed of to hold the new foundation. Tooth coloured material is used as it can be placed in increments. The crown is placed over the build-up of the foundation to ensure it still sits on the root/tooth. It is set with a light as it is built up. When the dentist has enough h foundation the crown is then re-cemented, and the bite adjusted to reduce the loading on the tooth.